I used to run chronoswissforum.com before I ended up getting e-mails from Chronoswiss that they would take some ‘steps’ if I didn’t change the content and the use of ‘colors’ on the forum. That was when the fun for the brand ended for me (I still have the Chronoswiss R?©gulateur in my collection). 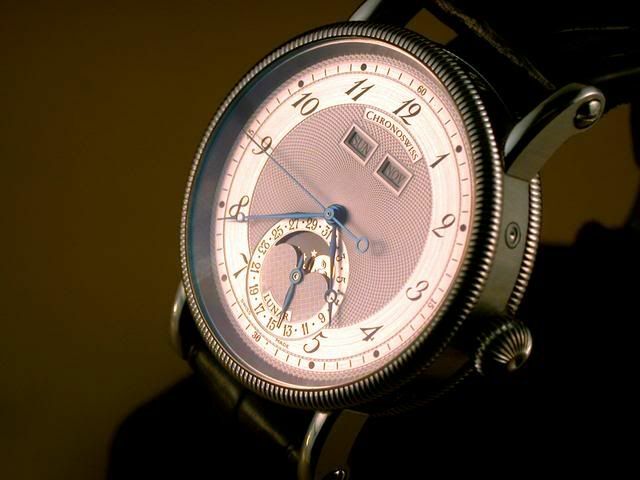 Anyway, TimeZone has a Chronoswiss Forum as well since then and once in a while I hop over to look at some nice pictures. A visitor or TimeZone, GScott, just bought a new Chronoswiss Lunar and took some marvelous pictures. This one might be worth reconsidering another purchase from Chronoswiss for me 🙂 I love to have a moonphase watch in the future.